Illustrated by Phyllis Limbacher TildesPublished: 1996Non-fiction, Puzzle picture bookSummary:The book gives several clues along with a close up picture of several black and white animals. The child must guess what animal he/she thinks it is and turn the page to see if they are correct and learn more facts about the animal. The end of the book has an instructional glossary with even more facts about the animals.Evaluation:The book is a great one to have children to listen to the text and look at the pictures to put together what animal is being described. The book is intended for emergent readers but I think some of the vocabulary would be a little difficult. I would definitely used the book for an interactive read aloud in the younger grades. The illustrations are beautifully done, both the close ups and the full pages. The text is always in the left upper corner so the students know where to look. The book is very organized with every four pages dedicated to the same animal. The facts are accurate and give enough description without overwhelming the reader. None of the facts appear to be outdated.1) Vocabulary to go over: predator, mammal, bamboo, and chrysalis. In the first lesson maybe read the book and then ask the students what they think the words mean based on the context clues and then review with every subsequent reading.2) After reading the book, ask the students why they think the word fly is in quotation marks. I viewed the audio/visual version of this on Tumblebooks. It's intended for the K-3 audience, but could really be pushed down to preschool. The narrator's pleasant voice gives us a riddle ending with "What am I?" and the next page shows the animal. All the animals are black and white, including the loon, panda, skunk and orca whale. Each riddle gives out clues as to the animal - eat bamboo, use a smell to scare away enemies, etc... This is an easy version to follow since the words are highlighted as the narrator reads them. When the riddle is being read, only part of the animal is being shown. When the animal is revealed, you see it in its entirety and it is moving, which is captivating for children. Animals Black and White received good reviews from Kirkus, among others, and I've used it with Kindergartners as part of our non-fiction curriculum and they really enjoy trying to figure each riddle out. This could be extended into a project where the kids write their own riddles to share with each other and made into a non-fiction class book. It would also be a lesson on fluency since the narrator speaks smoothly and emphasizes the punctuation (question mark) with each riddle. I read this book on www.tumblebooks.com.The sentences or phrases were highlighted as the narrator read each riddle describing a black and white animal. Then, the text asks "What am I?" before the animals name is given. I liked how the pictures of the animals slowly came into clear view as the clues were given instead of using a stationary image. The aspect of this book that I think is the best is that after the animal is identified, ther is more information given about that animal. Often, once the riddle is solved, a new riddle begins and it doesn't give a child time to process all the information just received from the text. The reader is expected to switch gears immediately to a new animal or idea. I also loved the descriptive vacabulary used in this picture book written for preschool or Kindergarten children. black and white pics where you see just a small portion of an animal and some clues about them. You have to guess who they are - followed by full color pics of the whole animal in their environment and more interesting info about them. Goes through a list of animals that are black and white with clues about them. The children guess which animal they are. The animals include: a zebra, an orca, a panda bear, a loon (duck), a skunk, a penguin, and a butterfly.Can do an activity where the children dress up as the animals. Claire loved this book! Every time there was a baby animal on the page she "awwwed" her little heart out. So sweet! Great nonfiction book for young children. Watched this book on Tumble Books; a neat service. Excellent factual text within a guessing game. Beautifully illustrated. 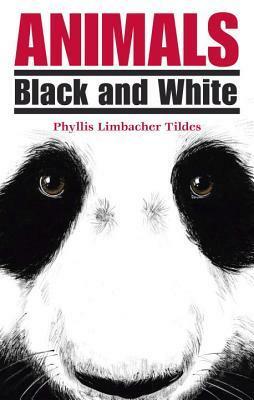 This is a great book to talk about animals with the colors black and white. It also describes fully the animals that are black and white.